So being the Wine Predator that I am, I acquired numerous bottles of open and closed wine during and after the Wine Bloggers Conference that I either tasted before I left (nothing like a 3am taste and dump session to break your heart!) or I snaked across the border. Somehow, I was blessed to bring home three bottles of Okanagan merlot (pictured). One bottle of these bottles that made it home open was the Poplar Grove Merlot from 2009 that was part of the Red Wine Speed tasting on Saturday. I first tasted the Poplar Grove on Sunday and found it to be closed and just not that pleasurable compared to the numerous open bottles I had at my disposal (and to dispose of one or the other–several from Washington’s Silverback Vineyards as well as wines from Canada). Since this was a full bottle, I figured I’d take my chances and take it home. On Tuesday when I finally made it home, I was happy to see that ALLL the wine I had packed away made it safely. That evening, I pulled out the cork of the Poplar Grove to find that it was tasting marvelously and paired wonderfully with that night’s dinner of wild sockeye salmon simply prepared on the grill with lemon, olive oil, and salt and pepper. 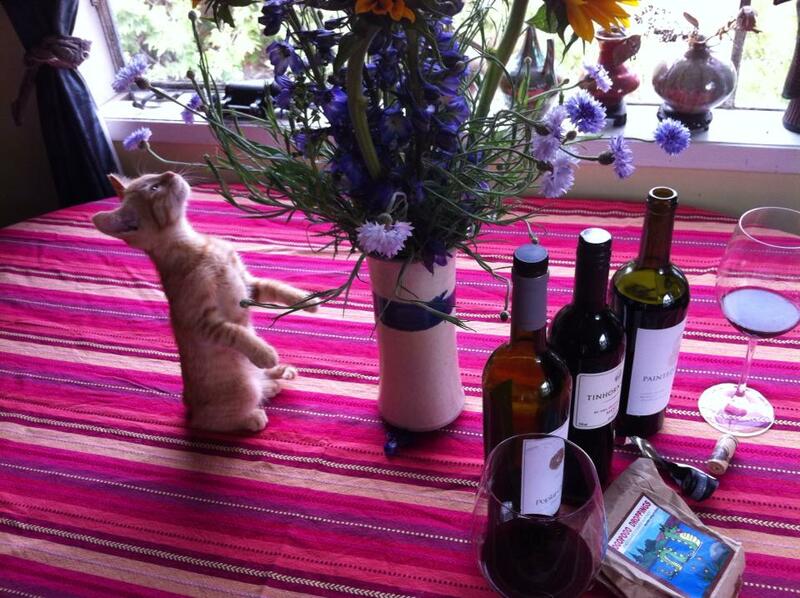 Yes, this merlot pairs great with the salmon! Certainly, Okanagan merlot pairs great with wild sockeye salmon! On Thursday, Annie AnyDay (because any day is a good for wine) dropped by to hear about my trip and try the Poplar Grove merlot before I drank it all up! First off, we both remarked on the dark mysterious color, then, on the palate minerality, salinity, and acidity–all of which I found typical of many wines in the region. “It tastes like this used to be underwater!” said Annie. Which is not surprising because the land where these grapes were grown used to be under the water of a glacial lake, and is now the Naramata bench. 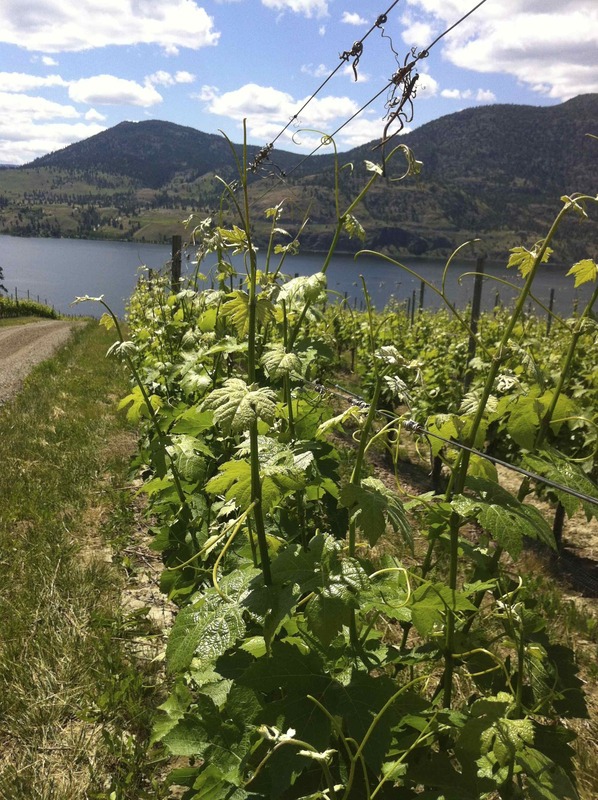 Because yes, you can taste all that–you can taste the Okanagan terroir in this wine…and in most of the wines from the Okanagan which is what makes this region’s wines so interesting. 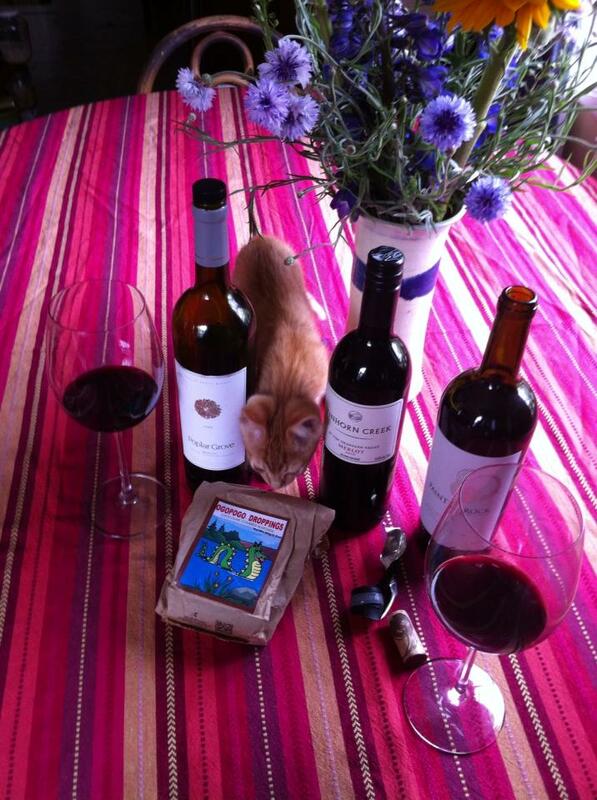 This merlot is magic just like the sea dragon, says Annie. Like most of the best wines I tasted from the Okanagan, the 2009 Poplar Grove merlot boasts a wealth of minerality–you get a taste of the sandy soils left behind from the lake shore. 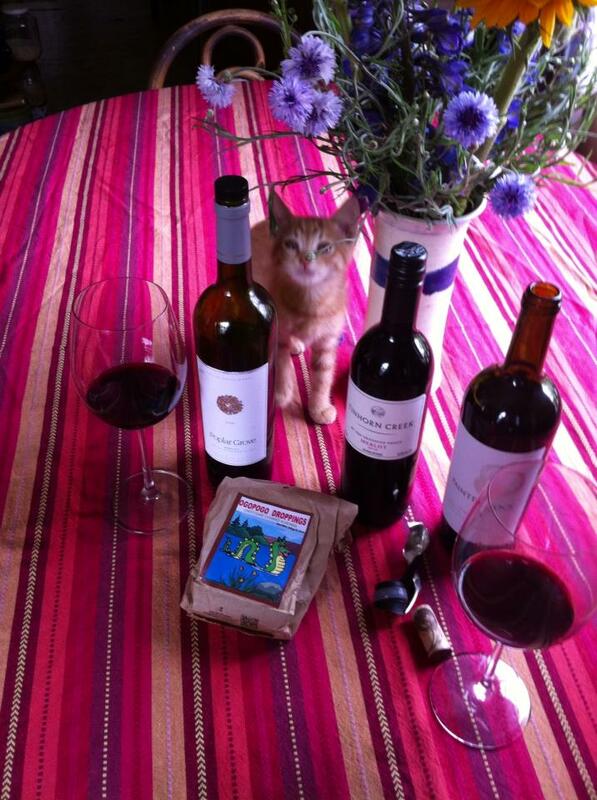 Annie picked up salinity and limestone, and remarked that for Californians, this is a very different experience of merlot. On a ranch, poplar groves protect the land from the wind. Annie knows this because she planted poplars for the Forest Service one summer as quick growing wind break trees. One reason we might really like it is that this wine was aged in French oak barrels for 18 months then in the bottle for another 18 months before it was released in 2012. The 15.4% alcohol at first was daunting but then it calmed down. On Tuesday, it had glorious fruit and a long finish. By Thursday, the complexity still shines, but it doesn’t have as much fruit left or a finish. The sweet spot on this wine right now is 48-36 hours after opening. Cork closure. $30. Pair with rich salmon, pork chops, steaks…it’s versatile. It’s got a little cab and cab franc in the mix. Biting acidity, sharp cinnamon, clove, cranberry. They used wild yeast. So then of course, I had to open another bottle so Annie could see what a freshly opened 2009 from the Okanagan is like. She really had to twist my arm I’ll tell you. And she twisted it so hard I almost had to open all three merlot from the Okanagan! I finally decided to save the Tinhorn Creek 2010 merlot for another day and open The Painted Rock because it was a similar vintage (2009) and with similar oak treatment (18 months). Plus it would be a good follow-up post to this one about Painted Rock. Simply put the Painted Rock 2009 merlot blew Annie away. It’s always interesting to taste a wine in various settings. I tasted the Painted Rock merlot at the Wine Blogger’s Conference during a session on judging, at the winery (brief notes in a previous post), and now here at home. It’s also always more fun to taste a wine with someone –to compare notes and metaphors, working together to finesse the various qualities of a wine. So that also contributed to why I had to open the Painted Rock for Annie–because we have such a good time trying to describe what we taste. Right off the bat, the wines are significantly different even though the grapes were grown not that far apart–Painted Rock is on a bench above Skaha Lake (pictured) and the other above Lake Okanagan on the Naramata Bench. Also, the wines are different because one was open nearly a week before the other (although recorked and almost full until Tuesday). So that could contribute to why the Poplar Grove was more brown than the Painted Rock which has more violet tinges to it instead of coral. Both are insanely dense wines. 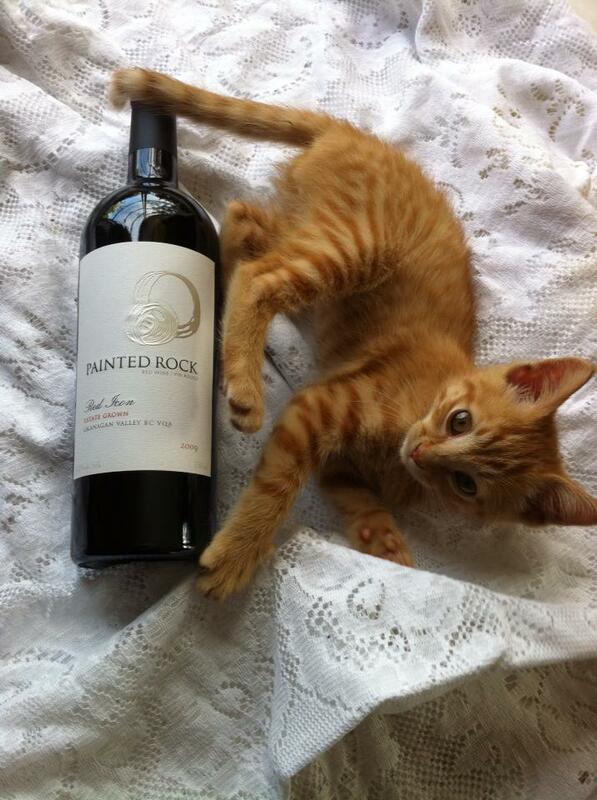 The Painted Rock 2009 merlot offers up notes of musk, sage, earth, truffles, mint, licorice, cinnamon. The wine rises to meet us seductively, luxuriously. It envelopes you–it’s not just a nose experience, there’s a perfume about it, that envelopes more senses than your nose. This wine is enticing, aromatic, it’s inviting to the senses, then when you taste it, it tastes as good as it smells–it has a voluptuous presence and a follow through. It’s complex, and flows– not a rough edge debenour, but present, elegant, velvet smooth. Annie says she loves this wine because it ‘s a gentleman–it rises out of the chair to meet you, opens the door to your senses. As we talked further, we realized that this merlot offers you a sixth sense–not only can you see, smell, taste, touch, (and hear if you splash) this wine, it also moves–and moves you. It was great opening this wine, tasting it with Annie, talking about the trip, sharing pictures with her, and discussing the various blog posts I plan to write. Because this is such an exceptional wine, we also talked about my plans for the rest of the bottle–to take it to the Live Oak Music Festival and to have it to celebrate Father’s Day with a nice local grassfed New York steak from Watkins Ranch! It turns out that Shane of Watkins Ranch rescued Annie’s horse trailer during a flood–he took his back hoe in to the center of the river and pulled out her four horse stock trailer! Wine. It brings people together. It brings out stories. You never know where a glass of good wine will lead you, do you? Happy Father’s Day! May you celebrate it with a glass of good wine! Reblogged this on art predator. Great pictures! Somehow the wine setting on this tablecloth looks particularly enticing. Thanks! Do you mean–The striped table cloth or the white lace one with the kitten attacking the bottle? 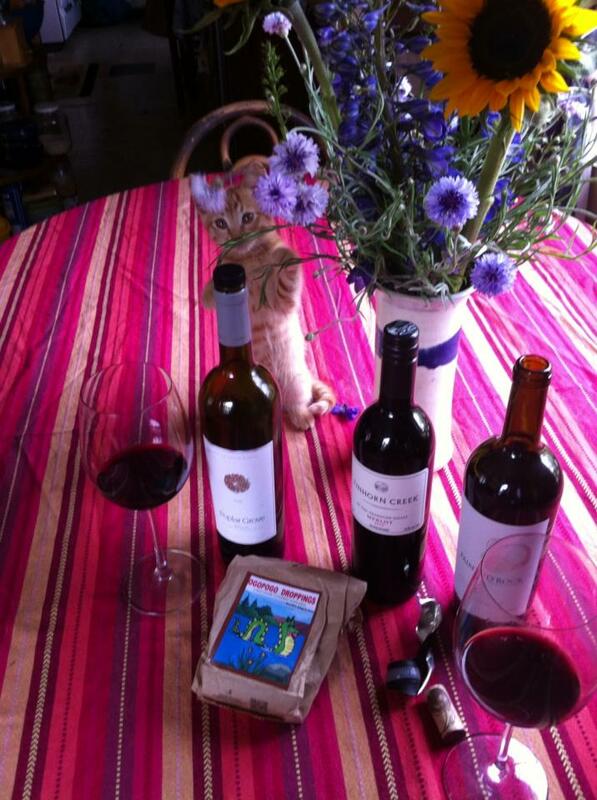 Hi Gwen, Planning to go wine tasting in Okanagan this Sept. Just re-read this post about 3 Merlots. What wineries should not be missed? Definitely go to Painted Rock! 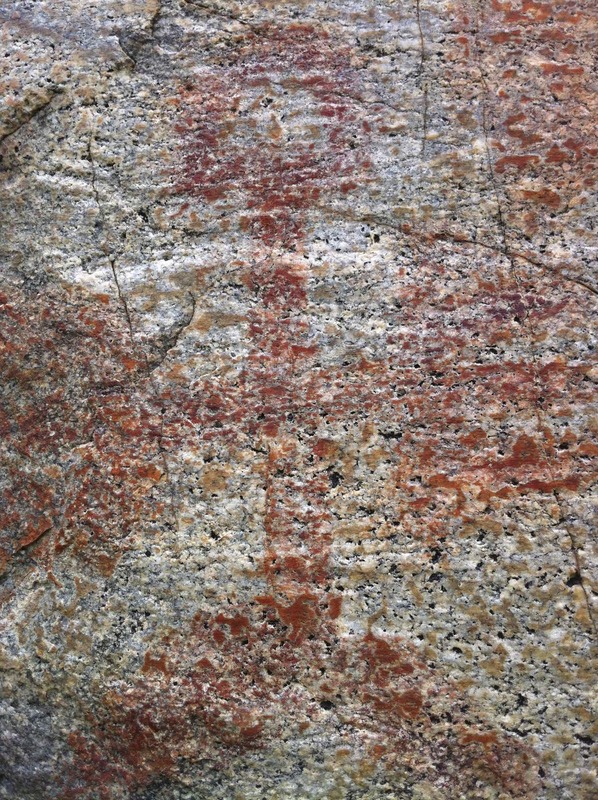 And it is a quick walk up the hill to see the rock art — and as a photographer you’ll want some shots of that and the views! 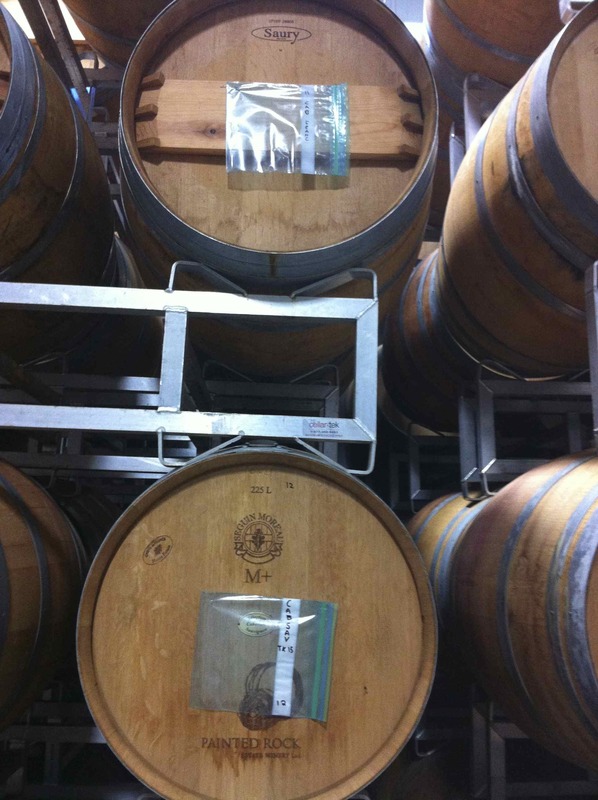 Tinhorn Creek is very large but great wines, an incredible restaurant and they are a leader in sustainability and taking care of people and planet (see my recent post https://winepredator.com/2018/01/13/welcoming-women-owned-wineries-and-winemakers-to-winepw-with-a-tribute-to-sandra-oldfield-of-tinhorn-creek/) They have great views as well and a lovely facility. Let me think about others and I’ll get back to you!